I struggle with cabin fever or winter blues the most this time of year. To combat this, I try to go out of my way to pamper myself a bit more than I usually do. Today I’m going to show you how to make a simple epsom salt foot bath with lavender and tea tree oil. I will show you how to make a big batch of it for four uses! You can simply store the extra in a jar or pass it along to friends or family as a great DIY gift! Pour 2 cups of epsom salt into a mixing bowl. Add 3 tablespoons of baking soda and stir until combined. Add about a 1/4 cup of dried lavender flowers. (this is an approximate amount – add enough until it looks good to you.) Lastly, add your lavender and tea tree essential oils and stir well. When you are ready for your Epsom salt foot bath, fill up a water basin with warm water. Add 1/2 cup of the foot bath Epsom Salt mixture. I also recommend adding 3-5 additional drops of each oil (or just lavender if you prefer) when you are actually doing the foot bath. That way the aromatherapy will be a bit more intense and lovely! Grab a cup of hot tea, sit back, relax, and enjoy! When you are ready to dump the water out, you can pour through a kitchen strainer first to catch the lavender flowers if you don’t want them to clog up your drain. If you would like to mix up a batch or two as a gift, go ahead and print the tag HERE! I printed mine out in a 2.5″ X 3.5″ wallet size. I filled clean baby food jars and covered the top of them with some white felt. I finished each off with some purple raffia to tie on the tag. This is a great one to pin now and save for a Mother’s Day gift idea! My two favorite oils. Don’t want to neglect the feet…. important parts of the body that take us where we need to go every day. A foot soak can be so relaxing. I have never tried tea tree oil but have heard it does many things including help with toenail fungus. Lavender is one of my favorite flower scents. This foot bath sounds delightful! Oh, this was tailor made for me. I travel all the time, so I’m always on my feet. I would love to end the day with a nice foot bath like this. I love making natural beauty products! Thanks for the great recipe. 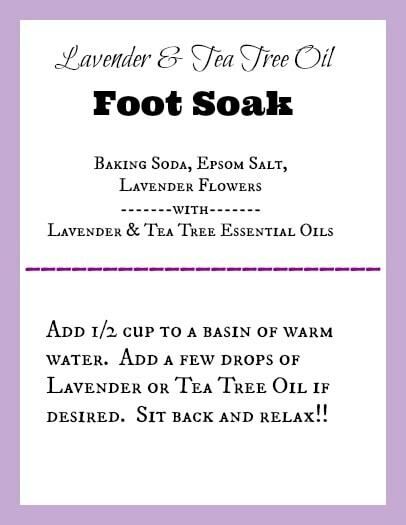 Lavender is such a lovely scent, I imagine this is a truly relaxing foot soak! Epsom salt is awesome for easing throbs and in addition detoxifying the body. The dynamic fixings in epsom salt are magnesium and sulfur, which retain through your skin when you splash. This mending salt is in charge of diminishing irritation, alleviating bothersome skin (sulfur), assuaging sore muscles and hardened joints, bringing down anxiety (magnesium), shedding skin and dispensing with poisons from the body. Hello. What a great mix. I knew the Epsom salt and lavender by their selves could be very beneficial to your health. And I can see that they could work together great. I love the fact you gave extra ideas on what to do with the remainder like give it away as a gift to you mother. I am sure she would love something like this. Thank you so much.